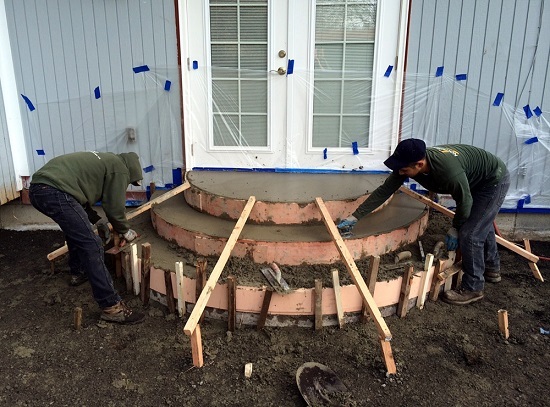 This Port Orchard project, consisting of stamped concrete steps and a patio, was poured and finished in January. That’s right, January. True, this past January was warmer than most. But we completed this project last January. And the winter before that, we completed this one. We pour and finish concrete year-round, and the clients who are willing to take the risk are rewarded with a substantial winter discount. 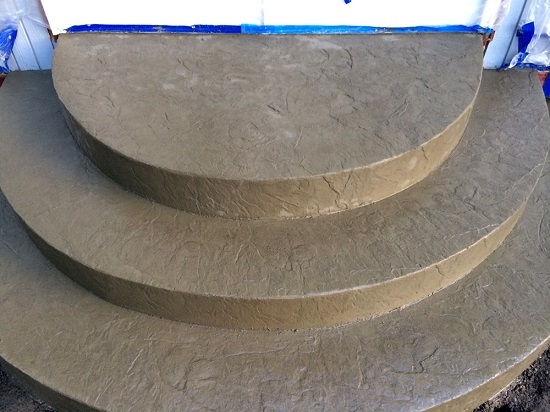 Our client wanted the shape of his stamped concrete steps to be round instead of square. It was a good call; the round steps work well with the curved shape of the patio. Forming up steps such as these takes a good amount of preparation, as you can see in the photo below. 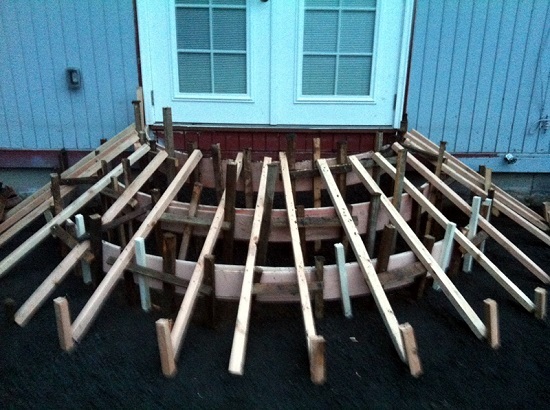 Wood stakes support the forms to prevent them from bowing out as the concrete is poured and hand trowelled. The forms were removed on the same day as the pour as the concrete is still wet enough to customize. Here you see Elias texturing the concrete steps with a Roman slate texture mat. Below is the final product after all of the finishing and texturing was complete. We returned to this site the following week to pour and finish the patio. The body of the patio was stamped with an Ashlar slate stamp, while the border was textured with Roman slate. 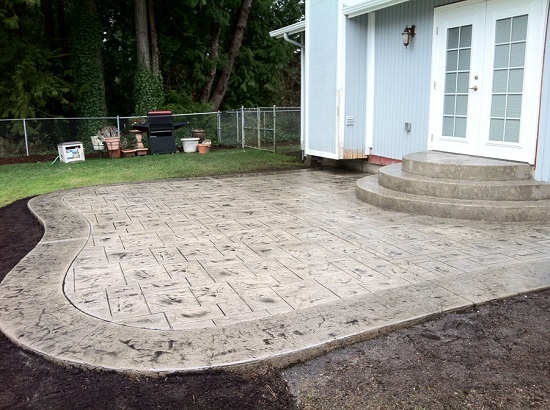 As you can see, our client opted to go with gray concrete instead of adding integral color. Because the color of his house is light blue with white trim, we agreed that gray was the right choice. Antique coloring was added for contrast and a marbling effect. We applied more antique coloring to the border, again, for contrast, so that the border appears darker and adds definition. 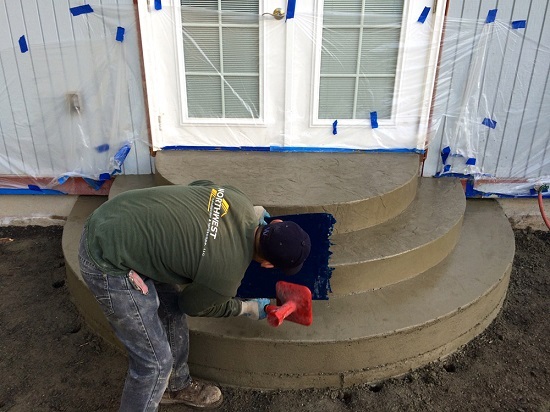 If you’re looking for a concrete contractor to help you install stamped concrete steps at your home or business, give us a call at 360-697-3215 to set up a free consultation and estimate. We’d love to hear from you!